We've been staying at cabins on the North Shore for 25 years and R & R is our favorite. The huge windows all across the front looking out at the lake, the comfortable furniture, the gas fireplace, the wonderful huge kitchen table, the beautiful pottery dishware, and especially the amazing deck - huge and goes right up to the rocks and water's edge add up to perfection. We also appreciate the closeness to Lutsen and a grocery store and to hiking trails. The best things about the house were the location, the comfortable, yet stylish furnishings and the decor!!! A nice big TV with DireTV and wifi (which I need to work), so the comfy couch, front porch swing and back deck were heavenly!!! It was beautiful! Only a few other cabins were nearby, so it felt more isolated, and it was so close to the lake. We had a couple fires on the beach and walked on the rocky shore. The home was cozy and comfortable. The only negative was the very salty water. They did provide Culligan water for drinking and cooking, but showering and brushing teeth were...salty. Overall, it was a wonderful stay, though, and I would book this cabin again. We loved the cozy cabin! It was very clean and comfortable. 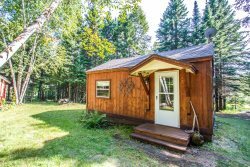 We loved the home, very cozy and comfortable, everything we needed, location was awesome right by the lake and near state parks and Gunflint Trail. We loved the chairs in front of the huge picture window, could look at the lake for hours. In terms of service, the online reservation service worked great, we arrived on Sunday so used the key box which was fine, drop off easy as well. We like that you are committed to recycling and make it convenient. Overall great experience!